When Jeff Bezos launched Amazon.co.uk on 15th October 1998 he was told it would never work, because people in Britain preferred to shop in “real bookshops”. Presumably, with Amazon just reporting quarterly income of almost $7bn, those critics are eating their proverbial hats. Online book selling is a huge international success. Period. Of course, they could do better. It is still true that the biggest proportion of books are sold in bricks and mortar stores. But since the advent of Amazon the total sales of books have dramatically increased. Amazon have helped make the pie bigger and are continually taking a bigger slice of that pie. But if you scroll down through their financial press release, you will find a hidden figure which is somewhat astonishing. In the past quarter Amazon has sold 180 ebooks for every 100 real books sold. In other words, ebook sales are approaching double the volume of physical book sales. No doubt the critics who said ebooks would never catch on are now sitting at the same hat-eating restaurant as those naysayers who reckoned online book selling was a fad. 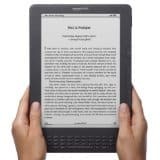 The huge popularity of the ebook reader, the Amazon Kindle, has clearly made ebooks more usable and approachable. Up until the invention of the Kindle, ebooks really could only be viewed on a PC screen or you had to print them out. And the cost of inkjet ink and your own paper was usually much, much higher than buying the printed version of the book in the first place. On the whole, old-fashioned ebooks were never really going to catch on. But thanks to ebook readers they have just become a whole lot more popular. Ebooks are convenient – you can take your entire library in your pocket. They are also cheaper than printed books. Price is clearly a factor driving ebook sales on Amazon. In fact, price is going to be a driver for a lot of online sales in the coming months. New data shows that shoppers are cutting back on spending and are looking for more ways to save money. In spite of the “end of the recession” (ha, ha) people are still feeling the pinch and want to spend less. That means whatever you sell online has to be priced well. Ebooks for the Amazon Kindle are a classic example of a new technology being able to provide a more cost-effective alternative at a time of financial hardship, resulting in wider acceptance of that technology. You can expect ebooks to become more popular, more widely accepted and to be the staple of education establishments – largely because it means otherwise expensive and out-of-date textbooks can be replaced with much cheaper up-to-date material, thereby improving education. Classrooms will have them instead of whiteboards. They will become the new “chalk slate” of primary schools. 1. What are you doing about your online prices and product availability while people are continuing to look for cheaper alternatives? 2.Are your information products being provided cheaply in Kindle form? If not, you are missing out on a potentially massive market. The Kindle success shows us that when times are hard, people look for the same products at a cheaper price and in a more convenient form. If your online shop can achieve that, you will do well even though people are preparing to spend less. Avoid the need to innovate and to be price conscious and your business will likely face even tougher times in the year or two ahead. And, if you are in the USA, you can read my blog on the Amazon Kindle…! USA copyright restrictions actually prevent other countries downloading my blog to a Kindle – even though you can get to it via the web…! Clearly the legislators need to catch up – again…! Oh, sorry, they can’t – they are too busy eating their hats.